Q: When connecting fiber optic cable between media converters or switches, do I connect the Transmit (Tx) port on one device to the Tx or Rx (Receive) port on the other device? The correct connection is always Transmit (Tx) port at one end of the circuit to Receive (Rx) port at the opposite end of the circuit. Transmit port to Receive port, Receive port to Transmit port. Q: Can I successfully connect a media converter or switch's 100BaseFX fiber optic port to a media converter or a switch that has a 1000BaseSX or 1000BaseLX port? Not directly. The standard for 1000Base (Gigabit Ethernet over fiber optic cable) transmission differs from the 100BaseFX Fast Ethernet over fiber optic cable standard in data rate and possibly in the frequency spectrum used to transmit this data. It is possible to make a connection to the other device using an appropriate media converter. Please call Signamax’s Technical Support experts for a recommendation best suited for your needs at 1-800-446-2377. Q: When I use a 10/100/1000BaseT/TX to 1000BaseSX or 1000BaseLX media converter to connect a 10/100Base T/TX switch to my Gigabit Ethernet switch, does that mean my 10/100 switch now has Gigabit Ethernet capability? No. The Signamax model 065-1196A series 10/100/1000BaseT/TX to 1000BaseSX or 1000BaseLX media converters use switching technology to convert the 10Base or 100Base packets your 10/100 switch presents to the media converter to the correct framing and format needed to communicate that data over a Gigabit Ethernet fiber (1000BaseSX or 1000BaseLX) connection. The fiber optic part of the circuit transmits at Gigabit Ethernet speed; the connection from the 10/100 switch will run at the highest speed and duplex mode that the switch can support. Please note that this means the actual throughput of the circuit will be no greater that that of the lowest speed connected device – in this case, either 10 Megabits per second (Mbps) or 100 Mbps. However, if a 1000Base capable switch is connected, it will transmit at 1000Base. Q: My Telephone Company, cable company, or Internet Service Provider (ISP) is providing me service over a 'T1 line'. They terminated this circuit in a telephone cabinet, and I need to bring that circuit back over fiber optic cable to where my T1 router is located in our Server Room. Can I use the 10/100 or Gigabit Ethernet media converters I have on hand to do this? Unfortunately, no. T1 circuits are a completely different type of data transmission that is incompatible with packet-based Ethernet data transmission. T1 media converters are relatively expensive and difficult to obtain quickly, since the market for them is relatively small compared to the market for Ethernet applications. Signamax does not currently have a T1 media converter product in our line. However, we at Signamax may be able to help you if the T1 connection is to be used for Internet access, private network data, or Voice over Internet Protocol (VoIP) services, rather than standard, non-VoIP telephone service. The T1 routers available from many manufacturers that are used to connect into a switched Ethernet Local Area Network (LAN) have two connections; one is a connection to the LAN, and the other is a connection to the T1 service provider, commonly called a Wide Area Network (WAN). Since most T1 routers are administered using the LAN port rather than a local console serial connection that requires close proximity to the administrator, there is no administrative reason to locate the router in the Server Room. If the router can be co-located with the T1 circuit termination (also known as a Demarcation Point or Demarc Point), the Signamax 065-11xx series of 10/100BaseT/TX to 100BaseFX media converters can be used to connect the router’s LAN port over fiber optic cable to the LAN switches, wherever they might be on the premises. Please call Signamax’s Technical Support experts for a recommendation best suited for your needs at 1-800-446-2377. Q: I see Ethernet media converters on the Signamax web site, but I have a number of devices to be connected that run serial data in either RS-232, RS-422, or RS-485 format. Does Signamax have any media converter that would suit my needs? Signamax’s model 065-1062A series media converters are designed for just such purposes. They are used as point-to-point media converters to extend individual serial data circuits. Please see the 065-1062A series media converter webpage for details, or call Signamax’s Technical Support experts for a recommendation best suited for your needs at 1-800-446-2377. 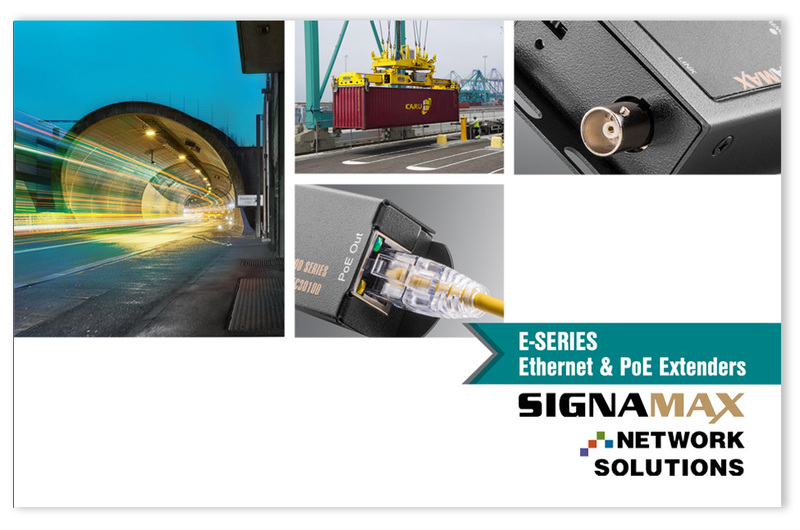 Q: I see Ethernet media converters on the Signamax web site, but I have to place them in a very harsh environment that gets extremely cold in the winter and extremely hot in the summertime. Does Signamax have any media converters that would suit my needs? Signamax’s Industrial Ethernet switches are designed to operate under exactly those conditions, with an operating temperature range of -40º F to 176º F (-40º C to 80º C). Please call Signamax’s Technical Support experts for a recommendation best suited for your needs at 1-800-446-2377. Q: I see Ethernet media converters on the Signamax web site, but I have security cameras that are analog, and I would like to run their video signal back to my security office using fiber optic cable. Does Signamax have any media converters that would suit my needs? Signamax does not support analog video on our media converters. However, there are third-party sources for devices that allow analog video cameras to be used in an IP network; such devices are called IP Encoders, and are available from a number of manufacturers. These devices can then use a Signamax Ethernet media converter to access an IP network via fiber optic cable. Both multimode models and singlemode models are available. Please call Signamax’s Technical Support experts for a recommendation best suited for your needs at 1-800-446-2377. Q: Can devices that are not Power over Ethernet (PoE) devices be plugged into PoE-capable switch ports? Yes. Signamax Power over Ethernet (PoE) switches, including those that support PoE+ Powered Devices, are equipped with PoE Auto-Detection. PoE Powered Devices are equipped, per the PoE and PoE+ standards, with a resistor in the device’s circuitry that is placed across their data cable pairs internally to identify to the PoE switch that the device requires power. If no such resistor is present, such as when a standard non-PoE Ethernet interface from a device is connected to the switch, the Signamax switch’s intelligent PoE circuitry will not provide PoE power to that port. Q: I see in their specifications that Signamax’s managed PoE switches can support a number of PoE devices of certain “Power Class” values. How can I determine what Signamax switch will support the number of devices I need to install? Power Class 0 — NO classification resistor present. A Power Class 0 device can draw between 0.44–3.84 watts at the end of a 100 meter copper cable run. Power Class 1 — A classification resistor is present, and its signature states that the Power Class 1 device will draw between 0.44–3.84 watts at the end of a 100 meter copper cable run. This is a “very low power” device. Power Class 2 — A classification resistor is present, and its signature states that the Power Class 2 device will draw between 3.84–6.49 watts at the end of a 100 meter copper cable run. This is a “low power” device. Power Class 3 — A classification resistor is present, and its signature states that the Power Class 3 device will draw between 6.49–12.95 watts at the end of a 100 meter copper cable run. This is a “mid power” device. Power Class 4 — A classification resistor is present, and its signature states that the Power Class 4 device will draw between 12.95–25.50 watts at the end of a 100 meter copper cable run. This is a “high power”, ”PoE+” device. Please note that the wattage values stated above are those delivered at the end of a 100 meter cable run — the maximum length of an Ethernet copper circuit. The actual wattage at the PoE switch’s port is 15.4 watts for the IEEE 802.3af standard for PoE, and 30 watts for the IEEE 802.3at standard for PoE+. As stated, this is the basic information needed to determine PoE and/or PoE+ loading. There are other complications involved as well which may or may not influence your system’s design. We at Signamax are educated and trained to take those complications into account when assisting you — just ask. Our assistance is free. Q: Can I use other manufacturers’ SFP and SFP+ modules in Signamax switches and media converters? Yes. All SFP and SFP+ modules meeting the SFP Multi-Source Agreement (MSA) are useable in Signamax switches and media converters. Q: Why do certain manufacturers (Cisco, for example) have their ports shut down when Signamax and other manufacturers’ SFP modules are used? Cisco, as well as certain other manufacturers, wish to ensure a “vendor-pure” environment in their installations. Most of the reason for this, in Signamax’s opinion, is due to those suppliers’ desire for market control. For example, if a SFP module is inserted into a Cisco switch or router product, the device’s Operating System will examine the “Manufacturer ID” entry on the SFP module’s EEPROM. If it does not state either “CISCO” or “FINISAR” (Cisco’s OEM optics manufacturer), it will instruct the switch to shut down the port. Some other manufacturers have also decided to have their switches’ Operating Systems do the same thing, for the same reason. These actions, however, are “out of sync” with the original intent of the SFP Multi-Source Agreement (MSA) , which provides a standardized set of dimensions and specifications that allow SFPs from ALL manufacturers to interoperate in multiple manufacturers’ devices. These actions, from a limited number of manufacturers, have limited YOUR choices as a consumer. We at Signamax believe that we provide the highest quality SFP modules in the marketplace, and we back those products with a Limited Lifetime Warranty. Q: Are both 1000Base SFPs and 100Base SFPs useable in a switch or a media converter? Not necessarily. Not all SFP receptacles accept either 100Base or 1000Base SFPs. Many products in the Signamax line can accept either 100Base or 1000Base SFPs; those that can do this have the port described in our literature as a “100/1000Base SFP port”. Other products accept only a single speed, most often 1000Base SFPs. Signamax describes such ports in our literature as a “1000Base SFP port”. Q: Can 100Base SFP modules and 1000Base SFP modules face each other across the same fiber span? No. Even though 100Base SFPs and 1000Base SFPs MAY use the same spectral frequency (e.g., 1310 nm), they still run at different, incompatible data rates (100 Mbps versus 1000 Mbps).